On June 9, 1864, the SS Pevensey, a Confederate blockade runner was run aground at Pine Knoll Shores by the Union supply ship New Berne. At the time the ship’s crew was disoriented, thinking they were much closer to Cape Fear than they actually were. To prevent Union capture of the supplies on board, the Pevensey’s crew exploded the ship’s boilers and then escaped to shore, where they were captured and taken to Fort Macon. One crew member was apprehended before even making it that far. 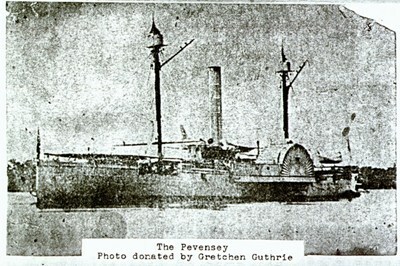 The Pevensey, an iron-hulled sidewheel steamer, was typical of the type of vessel used to run the federal blockade during the Civil War. The ship had successfully run the blockade at Cape Fear four times before she was lost. Though the Pevensey is less well preserved than other blockade runner wrecks in the Cape Fear region, people can actually see a portion it from the beach, making it a special curiosity. The wreck has captivated beachgoers for years, and is known locally as the “Iron Steamer.” It was studied extensively by the Office of State Archaeology in 2000.